Rick treats traditional pickles and pickled vegetables with a new spice palate. CAPSULE REPORT: What makes a jar of pickles—or pickled vegetables—worth $10.99? The same thing that imparts such value to a small cheese—craftsmanship that results in a mouthful of flavors you haven’t tasted before, and you want to taste again. Rick’s Picks makes beautiful brines that imbue cucumbers and other pickled vegetables with subtle spices. They’re the kind of pickles you’d expect to accompany a sandwich or burger at the Ritz. Rick’s Picks has been elevated to a Top Pick Of The Week. Read the updated Top Pick review. Cucumbers were probably first pickled 4,500 years ago in Mesopotamia, and were introduced around the world across trade routes. Cucumber pickling was known to the Ancient Greeks and Egyptians; by the second century B.C. it had reached China. Roman citizens valued pickled cucumbers as delicacies, and many different techniques were developed to pickle a variety of vegetables. Pickles spread, along with the Roman Empire, through the European continent. 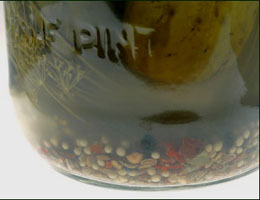 In Western European tradition, the pickling brine is often flavored with dill and garlic and a “pickle” generally refers to a pickled cucumber. In Korea, kimchi, the fiery pickled cabbage staple of Korea, is heavily seasoned with garlic and chiles and in some cases, radish juice; while Japanese pickles are usually an assortment of salty vegetables pickled in a soy brine. Some countries use sugar and fruit vinegar or wine vinegar for a sweeter pickle; some just add sugar. With the artisan food movement, better pickles have been appearing on condiment shelves and refrigerator cases. While better vinegar—and quality cucumbers* and spicing—will yield a better pickle, most of the artisan pickles we encounter are still versions of the classic dill variety—crisper, tastier sours and half-sours. We were tickled pink—or is that pickled pink—to discover Rick’s Picks gourmet pickles at our local farmers market. We have been happily munching on them for two years—sparingly, because they are a gourmet treat. *Technically, a gherkin is not only a pickle of a certain size but also a particular species of cucumber—the West Indian or Burr cucumber (Cucumis anguria), which produces a somewhat smaller fruit than the garden cucumber (Cucumis sativus). Some gherkins are made from the West Indian cucumber, but most are made from the garden cucumber. And yes, the cucumber is technically a fruit, not a vegetable: its seeds are contained on the inside. What Exactly Is A Gourmet Pickle? As made by Rick Fields, a gourmet pickle eschews salt and sugar for a complex layering of fine spices and fresh herbs in a brine that imbues subtly dazzling tastes into the vegetables. And the best-quality vegetables, grown on small Hudson Valley and Catskills farms in upstate New York, are tossed into the drink to pickle away. Rick’s Picks’ business office† is in the heart of New York’s Lower East Side, on Chrystie Street—the neighborhood of generations of pickle-makers who used to sell their products on the street. But Rick’s are not classic pickle-barrel pickles, fermented with vinegar, salt and water in big wooden barrels. Rick uses the hot-packing method, as home-picklers do, which requires heating the brine to 190 degrees. The brine and the vegetables are then placed in Mason jars, which are immersed in a hot water bath before sealing. The pickles—pickled cucumbers and other pickled vegetables—marinate away and are ready for consumption in a few weeks. †The pickles are made in a facility in Poughkeepsie, New York, about an hour away. Rick makes four types of pickles from cucumbers. All can be eaten at any time, any place, including right out of the jar. Each is a special experience for any pickle lover; but we’ve included some suggestions to try to help you decide where to begin. Bee ‘n’ Beez replaces the sugary sweetness of traditional bread and butter pickles with a sophisticated subtle sweetness from dried cherries and coconut, and adds a kick of ginger. SPECIAL USES: Sandwiches, burgers, plate garnish, hors d’oeuvres. Kool Gherks are the ultimate traditional whole dill pickles, cucumbers flavored with real dill flowers, which are packed in the jar—a unique experience. SPECIAL USES: Upgrade your current dill pickle. Spears of Influence is a dill pickle in a delightful cumin and lime brine. SPECIAL USES: Rick’s Dad chops these into his potato salad; Rick suggests the brine for dirty martinis. Slices of Life, traditional sliced dill pickles in an aromatic brine. SPECIAL USES: With pâté—create an hors d’oeuvre by combining pâté and pickle on a slice of baguette. GT 1000s (GT for green tomato) are the best pickled green tomatoes we’ve ever had, sweet and spicy with golden raisins, brown sugar and a happy convocation of spices. The brine includes allspice, cinnamon, curry, ginger and turmeric. The magical result is the flavor of extremely gourmet ketchup. SPECIAL USES: A garnish for burgers and sandwiches. Mean Beans are string beans in a cayenne-dill brine, a very spicy take on dilly beans. SPECIAL USES: As a Bloody Mary or martini garnish. Re-use the brine to pickle carrot sticks (more about this below). 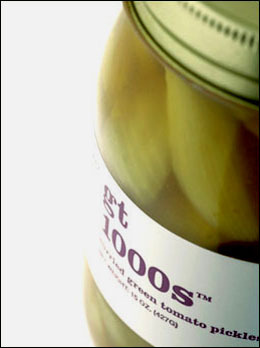 GT 1000s, pickled green tomatoes. Pepi Pep Peps, pickled roasted red peppers in a garlicky brine. SPECIAL USES: On regular sandwiches, grilled cheese and hors d’oeuvres. Phat Beets, one of our personal passions, are pickled beets and onions in a brine of rosemary, spicy ginger and lemon juice. A big sprig of rosemary in the jar reminds one where all the flavor comes from. The Phat Beets were prizewinners at the 2003 Rosendale International Pickle Festival. SPECIAL USES: As a bright and tasty garnish, as an hors d’oeuvre with goat cheese—take a toasted baguette round, spread with soft goat cheese and add a slice of Phat Beet. 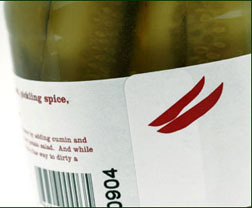 Smokra, the latest addition to the line, will change the mind of anyone who thinks that he or she does not like okra. Pickled okra, a southern specialty, is certain to warm the hearts of people in every corner of the world. The smoked paprika brine is brilliant. 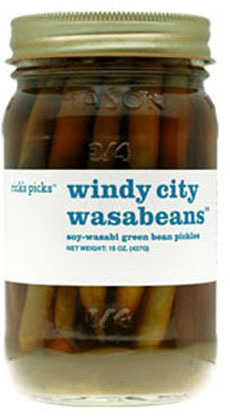 Windy City Wasabeans, one of the most popular items in the line, are string beans incubated in a brine flavored with soy and wasabi. The soy makes them both unusually smokey and piquant like olives. They have twice won Best In Show at the Rosendale International Pickle Festival. SPECIAL USES: Hors d’oeuvres, sandwich garnishes, plate garnishes. One bean draped across a piece of broiled fish or a chop is both a visual treat and a palate surprise. When the last pickle has been enjoyed, don’t think you’re left with an empty jar! The brine (a.k.a. 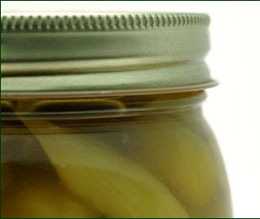 pickle juice) can create an entire second jar of delights, or be added to another kind of dish. Refill. When you finish with the original contents, add more: more green beans, more beets (use canned if you don’t want to go through the travail of peeling and cooking fresh beets), or try carrot sticks, broccoli and cauliflower florets, bell pepper strips, roasted peppers, et al. Refrigerate for four days and you’ll have more delicious pickled vegetables. Sliced onions turn into pickled onions that enliven sandwiches and burgers. Marinate. You can use most brines to marinate fish, poultry, vegetables or tofu. Add a little olive oil and chopped fresh herbs if you like. We marinated boneless chicken breasts in pure Rick’s Picks Spears Of Influence brine as an experiment. As the raw chicken bathed in cumin-lime vinegar with dill flowers, whole red chiles and garlic cloves, peppercorns and pickling spices, including large chunks of clove, we wondered if it the straight vinegar and water brine would be too much of a jolt. Nope—it was pure heaven. We didn’t even want a shake of salt. Barbecue. Most any barbecue sauce is improved with some brine—it adds tanginess and—in the case of Rick’s brine—dimensions of flavor. Cook. Mix brine in with the mayo for potato salad and cole slaw—it adds flavor and lowers the calories. Add to gazpacho: in food processor, purée tomatoes, onions, green pepper and cucumbers or zucchini. Thin with a little tomato juice and add the spicy brine. Here’s a recipe for Macaroni And Cheese from ILovePickles.org: Blend 1/2 cup milk, 1/4 cup heated pickled pepper juice [brine] and 1 teaspoon Dijon mustard; pour over 4 cups cooked elbow macaroni in casserole dish. Stir in 2 cups shredded cheese, top with bread crumbs and bake until bubbly. Add chopped pickled peppers for a colorful variation. Drink. Add to tomato juice or Bloody Marys. Instead of squeezing a wedge of lime into a beer, stir 1/8 cup dill pickle liquid into 12 ounces of your favorite beer and garnish with a Spear of Influence, Mean Bean, or Windy City Wasabean. Love pickles? More than 5,000 people attend the annual Rosendale International Pickle Festival in the Adirondack Mountains near Kingston, New York. This year’s festival is Sunday, November 19th, 2006 from 10 a.m. to 5 p.m. 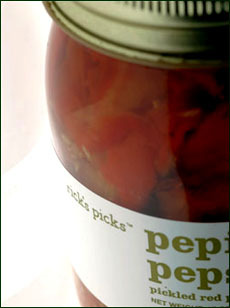 Enter your pickled goods for judging (Rick’s Picks has won 10 ribbons over the years). Don’t make pickles? You can still enter the Pickle Juice Drinking Contest and the Pickle Toss (where contestants team up to see who can catch the highest number of pickle chips in their mouths in the allotted time); or just enjoy sampling all the pickles, buy them to take home and listen to the music groups. For more information, visit PickleFest.com. As for Rick’s Picks: treat yourself and give them as gifts to other people who can taste the difference and would love to be tickled pink. Rick’s Picks are made in small batches with seasonal ingredients. Not all varieties are available year-round. The website has the current inventory. Prices are lower for quantity orders, e.g. Rick’s Picks are sold at specialty food stores in 20 states. Shipping additional. Prices are verified at publication but are subject to change.